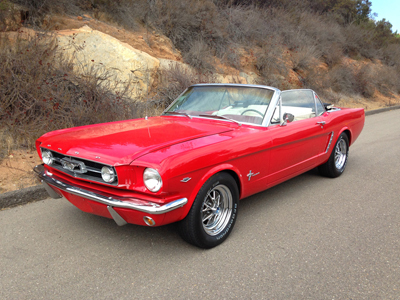 1965 Ford Mustang Convertible (GT up-grades) Last owner for 35 years. Approx. 60k. original miles. 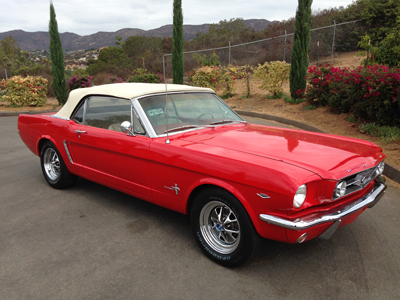 Built at San Jose Factory Used in Southern CA. CA. blue plate car (no Structural rust.) Rebuilt 289 motor-bored .030 over, All new rods and mains .010 under, (Factory A/C needs Freon service) RV Cam, new oil pump, new lifters, valve job, four barrel Edelbrock perf manifold, Holly four barrel carburetor. Rebuilt C-4 Auto Transmission and torque converter. New up-dated driveline including stronger driveshaft's and u-joints. Power brakes with disc brakes on front. New fuel tank and fuel pump. Rebuilt power steering system. New GT style steering wheel. New mufflers and dual exhaust system with GT style crossover and trumpets through rear valance. (It has a pair of rally pack gauges, go with the car) New turn indicator actuator. New parking lights and back-up lights. New paint (2014-16 Race red color) New external and internal door/window handles. 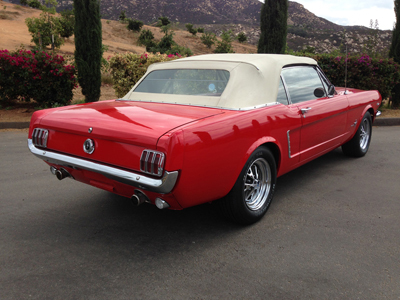 New Pony Parchment upholstery, red carpet New convertible top with glass window. few years by the previous owner. vin 5R08C0152.